A time management chart is an excellent tool to help you plan your week and review how you actually spent it. Using one will help you do more of what matters. Its appeal lies in the fact that you can clearly see just how much time you really have after you subtract your regular commitments and other ‘have to’ activities from the 168 hours that make up each week. A time management chart allows you to define the time that you currently get to choose how to use (which is invariably less than expected). You can also use it to look back at how you actually spent your time in compared to your initial intentions. At a glance you can see the big picture of your week. This means that you can plan with greater accuracy because you know just how much time is available when. For example, you may identify a large chunk of time - could you use this to schedule creative work ‘in the zone’? Often, it’s not until you see everything laid out in front of you that you realize just how much time you have...or how little. Once you know what goes where, it’s much easier to ‘trim the fat’ from your week. By breaking down each day, you can pinpoint those wasted minutes that can stop you from doing what you really want to do. Of course, only you can decide what constitutes wasted time and what doesn’t; but the chances are you’ll be able to identify opportunities to use your time more efficiently. You can use your time management chart to time box certain tasks each week to ensure they get done. For example, you can, with practice, allocate an appropriate chunk of time to dealing with emails, batching phone calls or less exciting but still necessary tasks such as organizing office files. The same goes for those important-but-not-urgent things that you want to do to move or improve your position. Your circumstances are unique, so there’s no ‘one size fits all’ approach. But the basic idea is to produce a breakdown of your week according to what you do. Obviously these are guidelines that provide a snapshot of the week. In reality, life isn't so easy to subdivide into neat little time portions. But a time chart is still effective as a tool to help you identify how you're using your time. 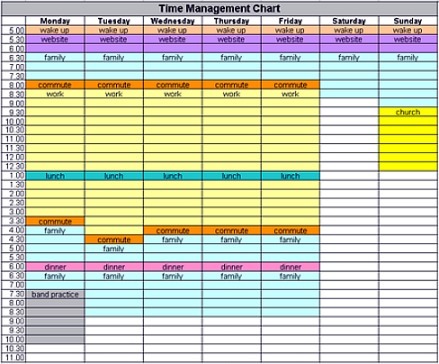 Make your own time management chart using a simple spreadsheet, either online or off. Adapt the timings on the left to suit your current lifestyle. Don’t forget to save it so you can alter it in the future, as and when circumstances change. The white spaces aren’t necessarily free time. How they are used may still need to be negotiated. But they do highlight the amount of time that is really available to get things done above and beyond the regular routines and commitments of the week. Similarly, work time can be sub-divided into various tasks - I may block off an hour late in the day to make phone calls, answer my emails or process some paperwork. The highlighted commitments of the week, whether they are work related or not, will expand and take up some of the ‘white time’ unless you put limits on them. No one else will do it for you, so decide carefully whether or not you’re prepared to stay longer at work and accept the knock on effect it has at home. On the other hand, there will be opportunities to carve out extra time for yourself if you can meet your obligations within the time allocated to them. I’m not advocating rushing around like a lunatic or cutting corners with commitments. But, by employing a few simple strategies, you will find you can get what you ‘have’ to get done quicker so you can do what you want to do sooner (this is the subject of my ebook). What about those blocks of time which are yours to use as you choose? How much time is spent well and how much is wasted? Only you can be the judge of that. It depends on what you value, how well you communicate with others what you want to do with it, and what your personal goal setting skills are like. This is the time when you can change or maintain the status quo in your life and work. The transition time (moving from one activity to another) has to be factored in. Generally speaking, the less you 'chop and change', the more effective you will be. Produce your time management chart. In just a few minutes you'll be able to identify what time you have.